From handheld cameras to complex multi-camera productions, there is a world of technological solutions to help achieve your creative vision. Whatever your production needs, Procam NY has it covered. Here’s a look at our top 6 most popular cameras. Sony’s most popular model, the PXW FS7, is a great camera and remains well used thanks to its very competitive price. The Super 35mm sensor and easily available mounts makes it possible to use either EF or PL lenses. 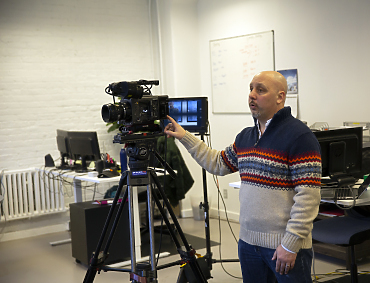 This makes the FS7 great for tailoring to specific productions’ needs, from run and gun to full cinematic set-ups. The ARRI Amira gives the same cinematic 35mm image as its siblings, the Alexa and Alexa Mini, while being designed to be more like a broadcast camera. Well suited for the single shooter, the camera has been ergonomically designed so that all the controls are in comfortable reach ofthe operator. The long-standing and competitively priced SONY F55 remains the camera of choice for multi-camera productions that want a drama/film look, but don’t necessarily want to pay more for ARRI cameras. DPs and camera operators that have grown up in the world of Sony naturally gravitate toward this camera. The Canon C300 Mark II, EF and PL mount is easy to use and shoots a great 4K image. It’s very popular with shooting producers/directors who want a shallow depth of field for a cinematic look. Plenty of extras are available in terms of rigs, making the C300 amazingly versatile and durable for such a small package. The Sony PMW 500 a trusted, tried and tested workhorse with a ¾-inch sensor. A diverse camera used by single operators and on large multi-camera shoots alike, the PMW 500 is always in high demand. The Sony A7S Mark II has the largest sensor out of the group, and while it isn’t necessarily designed for professional video production, its 4K capabilities and excellent performance in low light means it’s a very popular camera for B-roll, gimbals, drones and productions with a more restrictive budget. With the release of various models with resolutions from 4.4K to 6K, manufacturers are pushing the boundaries of sensor technology and large-format cameras. It promises to be an exciting time, as these cameras are sure to have an impact on shoots across the board and in all areas of production. We have your needs covered - get in touch today for a tailored quote!